We just came across a press release from an organization that every gay should be aware of: the Rainbow World Fund. 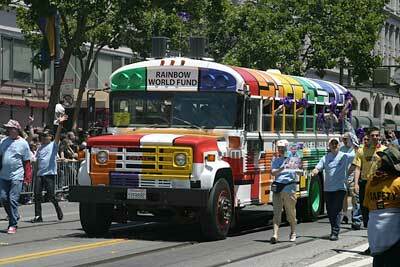 The Rainbow World Fund is a gay philanthropy organization that focuses on international giving. It’s the only non-profit that specifically promotes LGBT philanthropy in the area of global humanitarian relief. Over the last 7 years, RWF has contributed over $7 million in humanitarian aid on behalf of the LGBT community, in the form of medicine, medical equipment and grants. Some of the projects are the funding of household gardens in Haiti, which allows the devastated communities the ability to once again feed themselves, and the Bus of Hope, a pride bus that travels down to Mexico to deliver badly needed supplies to the LGBT HIV positive community in Tijuana. RWF also aids in providing clean water to villages in Africa, removing land mines in Cambodia, and helping AIDS sufferers worldwide. The Rainbow World Fund has just stepped up to rally the gays around the recent devastation in Japan. RWF has established the Northern Japanese Earthquake Relief Fund in collaboration with its partners in the Japanese American community. The need is growing: over 8,400 people have died and 18,000 are still missing and presumed dead. Hundreds of thousands are homeless and millions are without electricity or even running water. “Rainbow World Fund’s work is about serving humanity, gay and straight alike. LGBT people in the United States worked actively on relief efforts for Katrina and the tsunami, and we will do the same in response to the crisis in Japan. It is our hope to see this multiplied many times by the generosity of the LGBT and friends community,” says RWF Founder Jeff Cotter in a statement. The Relief Fund is backed by a coalition of community groups, and promises that 100% of donated money will go directly to groups in Japan. These groups are providing food, water, clothing and shelter directly to victims, and need as much financial support as possible. They are also conducting citizen searches and beginning the long process of rebuilding essentials like orphanages. If you would like to help, please visit the Rainbow World Fund and donate. Mention “Japan” when you are prompted to tell them how you want them to use the donation. You can use a credit or debit card, or also send a check to: Rainbow World Fund, 4111 – 18th Street, Suite 5, San Francisco, CA 94114. Please write “Japan” in the memo if that’s where you’d like your kind donation to go. We here at Unicorn Booty truly believe in the power of our dollars – gay is good, and we can do good together as a community. We face a lot of adversity being gays in this often cruel world, and yet we are still standing. We are proof of the resilient nature of human beings, and we know that Japan will overcome this trio of terrible disasters and stand stronger than ever before. And with your help, the Rainbow World Fund will use the our generosity to truly change the world.